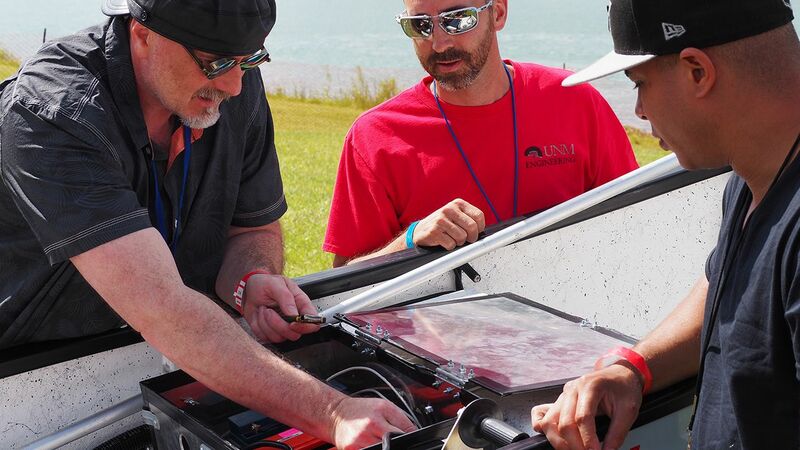 (l. to r.) Mechanical engineering Professor Peter Vorobieff and students Daniel Taylor and Joshua Stewart work on the boat during Solar Splash. 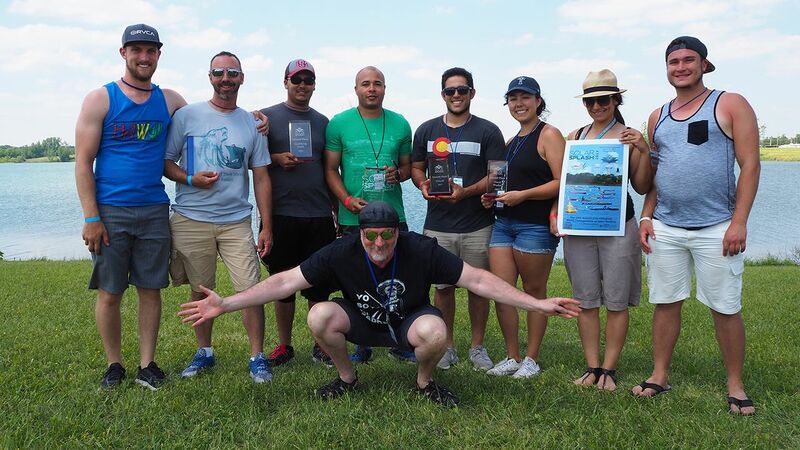 The members of the UNM Solar Splash team who traveled to Ohio pose with their awards after the competition with Prof. Peter Vorobieff (front). 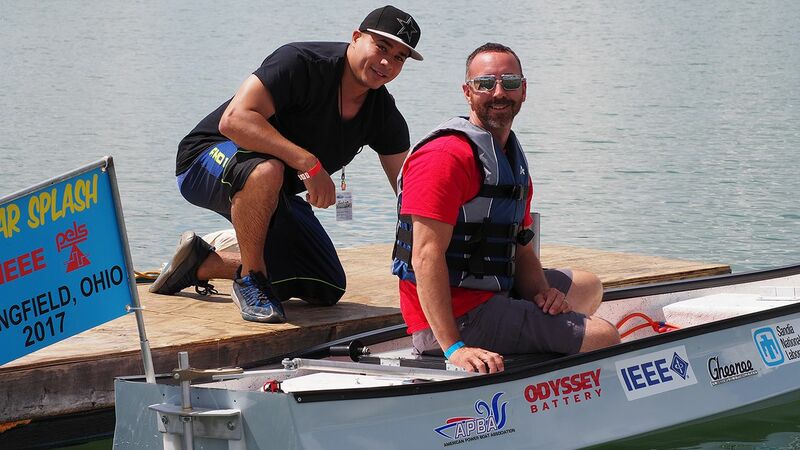 (l. to r.) Joshua Stewart and Daniel Taylor in the UNM Solar Splash boat during the competition in Springfield, Ohio. Engineers are known for being organized, analytical and prepared with a plan well in advance. But sometimes, despite research, testing and complex calculations, the best-laid plans throw a curveball, forcing engineers to act more like ER doctors in crisis mode than calm and in-control logical thinkers. 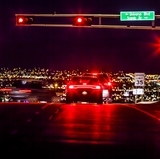 That’s what happened to The University of New Mexico’s Solar Splash team just a few days before the team was set to drive to Springfield, Ohio, for the June 7-11 competition. On the Friday evening before the Monday that the team was set to take the boat to Ohio, they literally experienced a meltdown. Even though it was supposed to be sun-proof, the deck material melted after just a few minutes in the Albuquerque sun, shattering multiple photovoltaic cells. Clearly, it was time for Plan B.
Luckily, Peter Vorobieff, the mechanical engineering professor advising the team, was at the hardware store when he received the crisis call. Being an engineer, he came up with a quick solution. “I purchased some California oak, and we built a new deck for the cells,” said Vorobieff, who picked up woodworking skills in high school. Then, the next 48 hours were filled with a lot of teamwork, as Maurice and Joshua Stewart, another electrical engineering master’s student, worked feverishly to rebuild the array, testing each cell, and replacing about 50 cells. They even called in a reinforcement — electrical engineering undergraduate teammate Naveed Jafari — to help out. Even after doing this, the team was still soldering the silicon bypass diodes in place after they arrived in Ohio. This year, the team opted to purchase highly-efficient solar cells (which have an efficiency of more than 30 percent vs. around 18 percent efficiency of conventional cells) from SolAero Technologies of Albuquerque. Although the SolAero cells, normally used in space applications, required a learning curve to work with, the team was able to design an array of panels with the cells. After the meltdown of the backing material, the team didn’t have time to reconstruct the entire array with the needed power with the SolAero cells, so they decided to supplement the SolAero array with cells they used on last year’s boat. It wasn’t Plan A, but it did get the job done, keeping the boat powered throughout the entire competition. Despite this glitch with the deck, the UNM team was awarded the Outstanding Solar System Design Award at the competition, largely due to using such advanced, unique cells, some creative craftsmanship, and also because — for the second year in a row — they were the only team to build their own array. “We were the only team there with space-grade cells,” Vorobieff said. Although the team’s seventh-place overall finish (out of 13 teams to finish and 16 to compete) was lower than last year’s fourth-place finish, this year’s team actually performed better than last year. “We improved our boat and performance, but our competitors improved too,” Vorobieff said. The team also placed second in qualifying and second in visual display. The meltdown days before the competition wasn’t the first adversity the team faced, though. About a week before, after Maurice and electrical engineering master’s student Joshua Stewart spent countless hours preparing the SolAero cells for their designed configuration, they were preparing to finalize connections and realized that 80 percent of the cell pairs had faulty connections, making them inoperable. Catching that near-fatal issue was thanks to the wisdom of Jane Lehr, the professor leading the electrical engineering side, who kept emphasizing to test every step of the way. Jafari, who would also be called in to assist after the later meltdown, was called in to help out. With a week of long hours, they were able to assemble what they believed at the time was their complete array. Vorobieff said he is already thinking about next year’s design. He plans to keep the Gheenoe hull purchased this year and would like to use the SolAero cells, but redesign how they are mounted. He also would like the student team to redesign and replace the drivetrain, which was largely unchanged from last year’s boat. A project of this magnitude cannot be done in a vacuum. Twelve electrical and computer engineering students and nine mechanical engineering students participated in the Solar Splash team, led by mechanical engineering students Michael Anselmi and Daniel Taylor and Joshua Stewart on the electrical engineering side. Vorobieff said invaluable technical assistance was provided by individuals at two local companies — Steve Taylor from Taylor Marine and Alex Stavrides at SolAero. 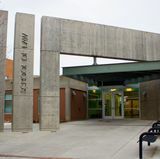 In addition, he said Diana Sargent, senior fiscal services technician in the Department of Mechanical Engineering, made sure the equipment purchasing went smoothly on the UNM end. 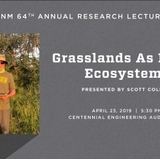 Also, Vorobieff said both the mechanical engineering and electrical and computer engineering departments at UNM provided generous support to the effort, especially Lehr, who led the electrical engineering side of the project, including the solar array design and construction of the maximum power point tracker to charge the batteries. To donate to the 2018 Solar Splash team, go to https://www.unmfund.org/fund/solar-splash/.